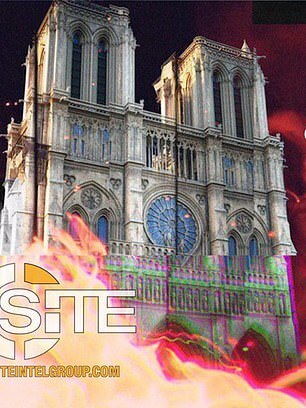 The extremist media group published the graphic showing flames in front of the Paris cathedral’s bell towers, which survived Monday’s blaze. 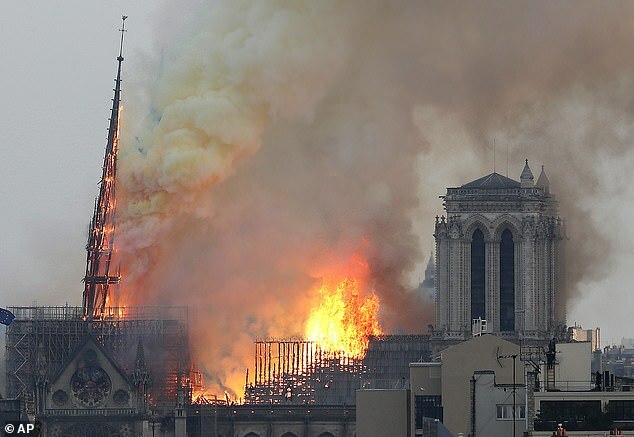 There is no indication that the fire was linked to terror but ISIS fanatics have revelled in the damage to the 850-year-old landmark, a symbol of Western civilisation, just days before Easter. 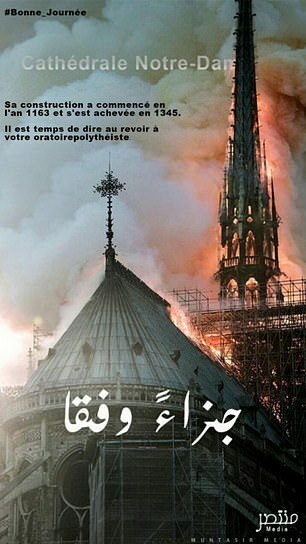 As the church burned on Monday night the ISIS-linked Al-Muntasir group had published a poster of the blazing cathedral accompanied by the words: ‘Have a good day’. Al-Munatsir has previously shared propaganda rejoicing in terror attacks which have rocked France. Notre Dame had previously the site of a terror scare in 2016 when a car carrying seven gas cylinders was found near the cathedral. Three women were arrested over the alleged terror plot, although they were thought to have been targeting a Paris railway station rather than the cathedral itself. Fifty investigators are now working on a ‘long’ and ‘complex’ probe into the cause, Paris prosecutor Remy Heitz told reporters. 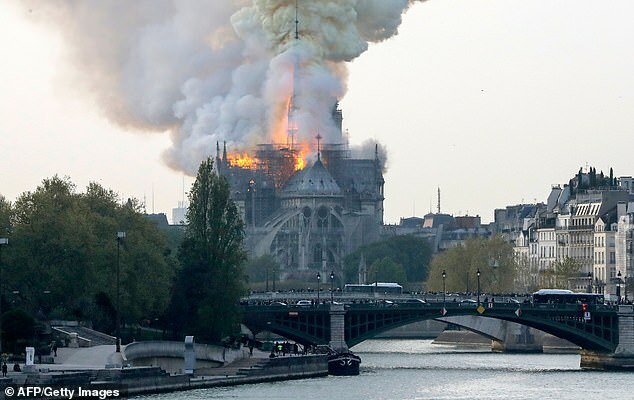 A Paris judicial official said investigators have questioned about 30 people after the fire at Notre Dame Cathedral. He said most of them were employees working on the renovation of the monument, including the now-collapsed spire. The tragedy prompted an outpouring of support internationally, with the Queen saying she was ‘deeply saddened’ and Pope Francis offering his prayers. Huge sums have been pledged to repair the beloved Paris landmark, which President Emmanuel Macron has set a target of five years to finish. 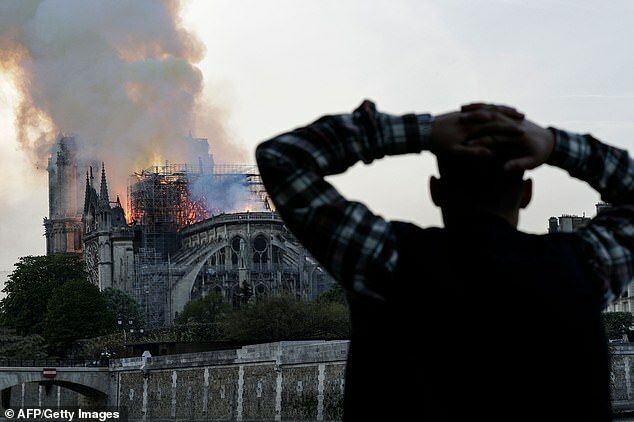 He said France ‘will rebuild Notre Dame Cathedral even more beautifully’ as he addressed the nation little more than 24 hours after the devastating fire. 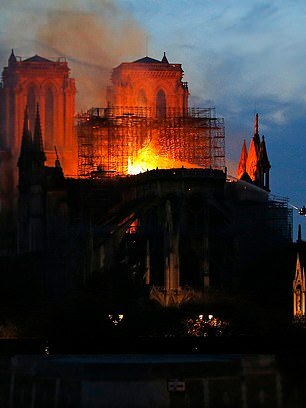 Notre Dame’s heritage director has said only one piece of architecture inside the sacred building has been damaged. Laurent Prades says the high altar, which was installed in 1989, was hit and harmed by the cathedral’s spire when it came crashing down in the flames. ‘We have been able to salvage all the rest,’ said Mr Prades, who witnessed the recovery first hand overnight. 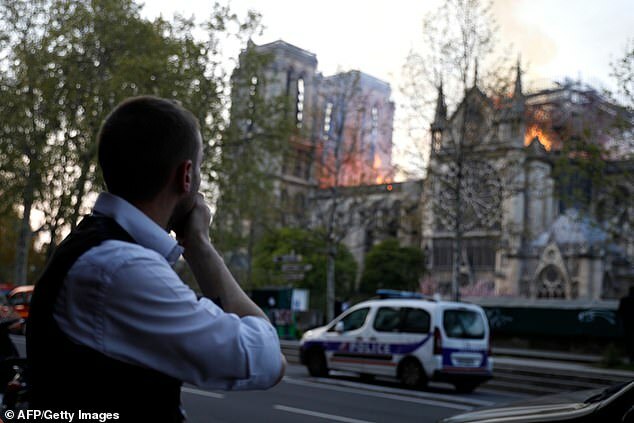 Jean-Marc Fournier, chaplain of the Paris Fire Brigade, was hailed as a hero after he joined firefighters in the burning cathedral to rescue the holy relic. He had also helped the wounded in the wake of the Bataclan terror attack in Paris in November 2015. Notre Dame’s three ‘irreplaceable’ Rose Windows, which date to the 13th century and were feared to have melted or exploded, were also intact. Father Fournier had also survived an ambush in Afghanistan, in which 10 soldiers were killed, during his time as an army chaplain.